These additional things can be added to many Lumedyne Systems to allow additional options. 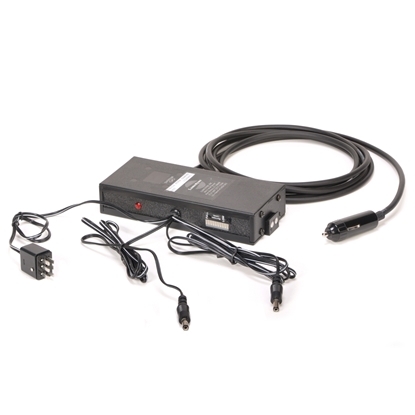 AC Power Adapters allow you to run continuously from AC power rather than needing to use the batteries. Boosters stack in between the Battery and Power Pack in order to add more power watt seconds (ws) to the system. Some Boosters add extra asymmetrical head jacks for added versatility. High Speed Modules attach between the Pack and Battery to create faster recycling times. 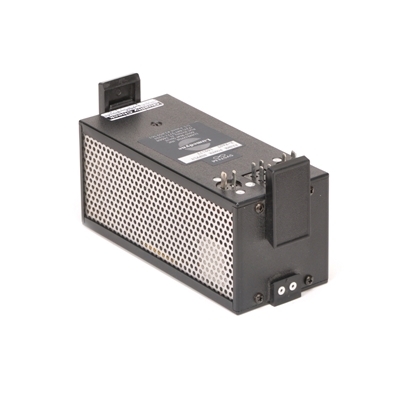 This Power Supply can power a Lumedyne system from any AC wall outlet worldwide. It has an interchangeable AC power cord and you select that at purchase, but the default is the American cable as the XPSU. 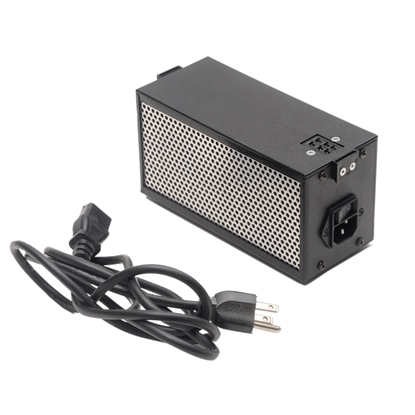 This AC Power Supply is small and lightweight. It's only about three inches tall and weighs about 2 pounds, yet it can keep your Lumedyne recycling all day long. This Power Base will power an Extra Fast recycling Lumedyne system from any AC wall outlet worldwide. It has an interchangeable AC power cord and you select that at purchase, but the default is the American cable as the XACU. 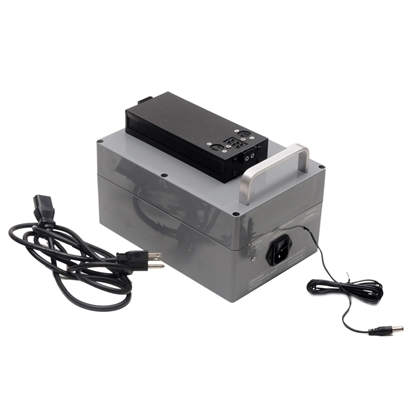 This AC Power Base also charges a NiCd or NiMh Battery with a Hyper Speed Battery Charger built inside of it with a short DC charge cable that can be mostly hidden inside the body of the power supply when not in use. The X2BC goes between the Battery and most Lumedyne Power Packs to add 200ws of additional power to the Pack above it. It has an on/off setting for the extra Boost power. It is very small and only weighs about a pound and will add an f-stop to the 200ws Packs since it doubles the available power. The X2DL Deluxe Booster goes between the Battery and most Lumedyne Power Packs to add 200ws of additional power to the Pack above it or add another Head jack that can be powered at 100ws or 200ws regardless of what the Pack is set at. This allows for a wide variety of asymmetrical power options. It has a switch for the Head jack power selection or to send the extra Boost power up to the Pack above it. It is only about three inches tall weighs about two pounds and can add an f-stop to the 200ws Packs since it doubles the available power. The second Head jack syncs together with the rest of the system. The X4BC goes between the Battery and most Lumedyne Power Packs to add 400ws of additional power to the Pack above it. It has a switch that controls: no boost, or add 200ws, or add the full 400ws to the Power Pack above it. It is only about three inches tall and weighs about 2.5 lbs. and it will add an f-stop to the 400ws Packs since it doubles the available power. For the 200ws Pack, that's a stop and a half brighter. These are also stackable to go up as high as 2400ws by adding five of these to a 400ws Pack. The X4DL Deluxe Booster goes between the Battery and most Lumedyne Power Packs to add upto 400ws to the Pack above it. It has TWO additional asymmetrical head Jacks that can be powered at 100ws or 200ws regardless of what the Pack is set at. The front one can be boosted by the back to go to 400ws. This allows for the world's widest variety of asymmetrical power options. It has a switch for each of the two Head jacks in order to select the power or to send the extra Boost power up to the Pack above it. It is only about four inches tall weighs about three and a half pounds and can add an f-stop to the 400ws Packs since it doubles the available power. These Head jacks sync together with the rest of the system only one Head needs to be triggered and the rest sync together. 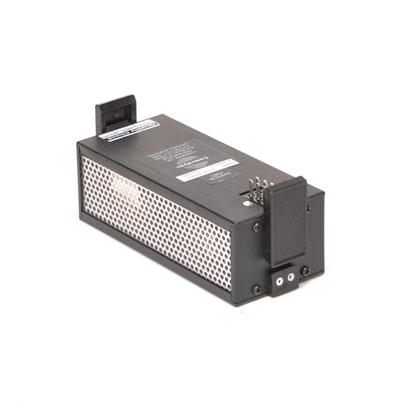 The XSMF is a High Speed Module that makes the Lumedyne flash system recycle faster. 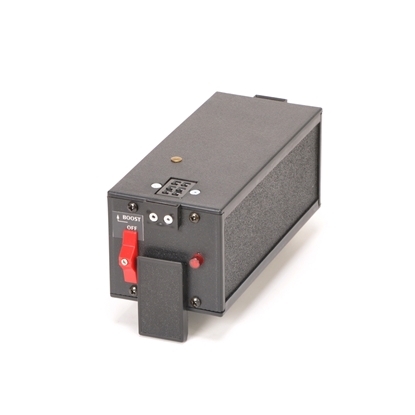 It plugs between the Battery and the rest of the system and creates a faster recycle time at any power setting. This doesn't help the Lumedyne system get brighter but does help it recycle much faster from Battery power or the current AC Power options. 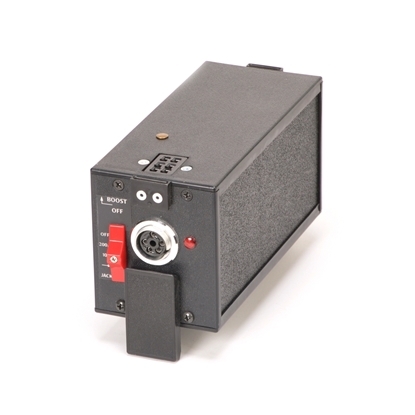 The XSMF is a very special High Speed Module that makes the Lumedyne flash system recycle much faster. 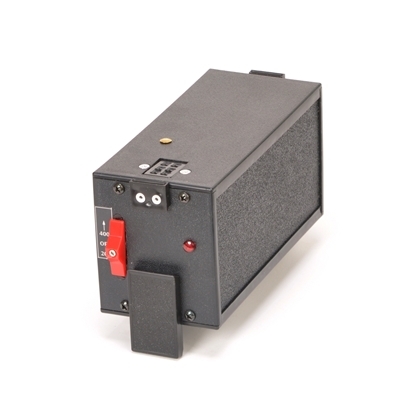 It plugs between the Extra Large Battery or a few other high power options and Pack or the rest of the system. 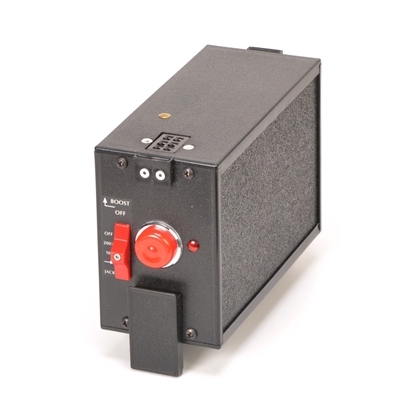 It creates a much-much faster recycle time at any power setting. This unit draws so many amps only the Batteries, etc. that have the extra power connections can work with this Speed Module. Any of the eligible Packs may be used and they won't get brighter. They will recycle super fast from those limited power options.